President Donald Trump says a lot of outrageous things on Twitter, his preferred method of communicating with the world. But a tweet on Monday was astounding for its, probably unintended, candor. “Two long running, Obama era, investigations of two very popular Republican Congressmen were brought to a well publicized charge, just ahead of the Mid-Terms, by the Jeff Sessions Justice Department. Two easy wins now in doubt because there is not enough time. Good job Jeff……,” the president tweeted Monday. There are so many things wrong with this statement that it is hard to know where to begin. Let’s start with the biggest. 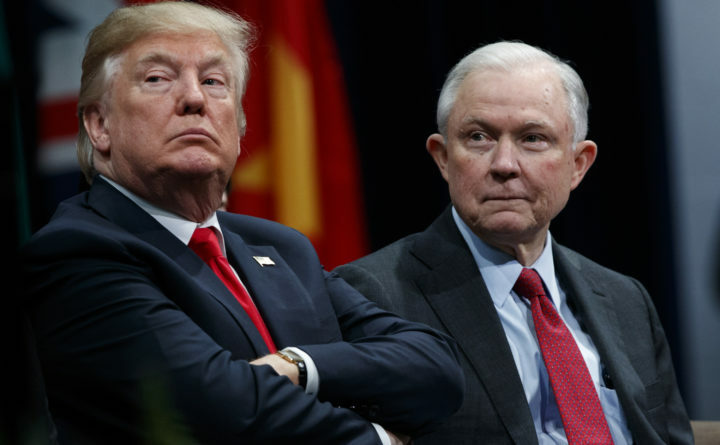 The president is saying that Jeff Session, the U.S. attorney general, should have held off on charging two congressmen with crimes because they are now in danger of losing their elections in November. This is bad for Republicans because they are in danger of losing control of the U.S. House of Representatives. The party cannot afford to lose two seats that were expected to stay in Republican hands. Losing control of the House would be personally bad for Trump because the House Oversight Committee may start investigating whether he, his company and his family members are violating the emoluments clause of the U.S. Constitution. The committee might actually investigate Russia’s connections to the Trump administration, among the myriad issues it is currently ignoring. But none of this should matter to Sessions and the Department of Justice, which he oversees. Sessions and the Department of Justice work for the American people, not Trump and not the Republican Party. If someone appears to have committed a crime, the department should investigate, no matter whether that person is popular, a Republican or a congressman. If the investigation concludes that a crime was committed, the person must be charged. That is how justice works. Calling on the department and Sessions to lay off political allies, and to go after “enemies,” which Trump has done, is a violation of the president’s constitutional responsibilities. It is also a crime to obstruct justice. He didn’t name them, but the two “very popular Republican Congressmen” are likely Chris Collins of New York and Duncan Hunter of California, both earlier supporters of Trump. Collins is charged with insider trading. He sits on the board of Innate Immunotherapeutics, an Australian drug maker. He also sits on the House Energy and Commerce Health Subcommittee, which oversees drug makers like Innate. When he learned the company failed an important test, Collins quickly alerted his son, who avoided more than $500,000 in loses from his investment in the company, according to an indictment. The calls took place at the White House in June 2017, according to the indictment. The investigation, of course, began after this date, when Trump was president, so this is not a long-running Obama-era investigation, as Trump claimed. Collins suspended his re-election campaign after the charges were announced last month. Hunter is charged with misusing more than $250,000 in campaign funds for personal expenses such as vacations, school tuition and theater tickets. He has denied wrongdoing but blamed his wife, who was also charged, for handling the money. He is still campaigning for re-election. Trump’s suggestion that the Justice Department put off investigations and charges that will hurt Republicans politically is absurd — and dangerous. No one is above the law. It is the Department of Justice’s duty to ensure this is always the case.